SAN CLEMENTE, Calif., May 1, 2014-On June 20, beachgoers and surf enthusiasts from around the world will come together to celebrate the Surfrider Foundation's 10-Year Anniversary of International Surfing Day (#ISD14). The nonprofit organization, which is dedicated to the protection and enjoyment of our world's oceans, waves and beaches through a powerful activist network, invites the public to save the date and get the day off work to join the fun! "As we gear up to celebrate the 10-Year Anniversary of International Surfing Day, we encourage everyone to share the stoke of surfing and love for our oceans, waves and beaches," says Laura Lee, Surfrider's Marketing and Communications Director. "With more than 100 events already registered in 15 countries, this official surfer's holiday provides the perfect excuse to paddle out with friends, enjoy the day and give back, no matter where you live." Participation in International Surfing Day is free. Many of Surfrider's chapters host a beach cleanup or an environmental project followed by a group paddle out, surf contest, yoga session, surf film or concert. To find an event or to register for one, simply visit isd.surfrider.org. Not near a beach or a Chapter on June 20? There are a variety of ways you can celebrate surfing and give back to our oceans, such as picking up trash, hosting an event and becoming a Surfrider Foundation member. Founded in 2005 by Surfrider Foundation and Surfing Magazine, International Surfing Day started with nearly 16 domestic and one international event, and has grown exponentially to 200-plus events in more than 30 countries. Since its inception, approximately 70 tons of trash has been removed from our coastal environments. 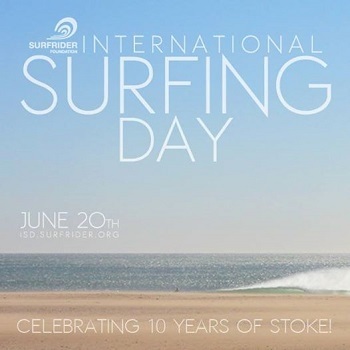 This International Surfing Day, Celebrating 10 Years of Stoke, is presented by the Surfrider Foundation, Volkswagen and ZeeBerry.com. "Volkswagen is proud to be a presenting sponsor of International Surfing Day, which brings together a likeminded community of people with a strong commitment to the environment," said Vinay Shahani, Vice President of Marketing, Volkswagen of America, Inc. "Surfing has always been a popular sport with Volkswagen owners and, as part of our Think Blue sustainability initiative, we're encouraging our dealer partners and owners to participate with their local Surfrider chapters nationwide." Media partners include Surfing Magazine and Surfline.com. In-Kind sponsors include Billabong, Spy, Vans, Firewire, Hurley, Rip Curl, Quiksilver, Roxy, O'Neill, Ocean Minded, Emergen-C, Earthpack, RVCA, Sanuk, Swell, Volcom, Rusty, Fresh & Clean Media, On A Mission, Fox, SIMA and Arbor. Get stoked and join Surfrider's 10-year celebration! To obtain a complete schedule of local events, ambassadors, special membership offers and contests, visit isd.surfrider.org (Share your Instagram photos with @surfrider and #ISD14). The Surfrider Foundation is a non-profit grassroots organization dedicated to the protection and enjoyment of our world's oceans, waves and beaches through a powerful activist network. Founded in 1984 by a handful of visionary surfers in Malibu, California, the Surfrider Foundation now maintains more than 250,000 supporters, activists and members worldwide. For more information on the Surfrider Foundation, visit http://www.surfrider.org. Founded in 1955, Volkswagen of America, Inc., an operating unit of Volkswagen Group of America, Inc. (VWoA) is headquartered in Herndon, Virginia. It is a subsidiary of Volkswagen AG, headquartered in Wolfsburg, Germany. VWoA's operations in the United States include research and development, parts and vehicle processing, parts distribution centers, sales, marketing and service offices, financial service centers, and its state-of-the-art manufacturing facility in Chattanooga, Tennessee. The Volkswagen Group is one of the world's largest producers of passenger cars and Europe's largest automaker. VWoA sells the Beetle, Beetle Convertible, Eos, Golf, Golf R, GTI, Jetta, Jetta SportWagen, Passat, CC, Tiguan, and Touareg vehicles through approximately 644 independent U.S. dealers. See www.fueleconomy.gov for EPA estimates. Individual mileage will vary and depends on several factors including driving habits and vehicle condition.